Peoples Voice Status of Muslims in West Bengal – Appeasement or Exclusion? / Rights / Status of Muslims in West Bengal – Appeasement or Exclusion? Status of Muslims in West Bengal – Appeasement or Exclusion? “Muslims constitute a very large proportion of the poor. The fact that Muslims in West Bengal are disproportionately poorer and more deprived in terms of living conditions is an empirical recognition that gives this report an inescapable immediacy and practical urgency,” said Amartya Sen while releasing the report entitled “Living Reality of Muslims in West Bengal” (The Hindu, 2016). This Report takes a stock of the condition of Muslims in West Bengal. The state of West Bengal is significant since 27.01% of its population is Muslims. Sachar Committee Report portrayed a very disturbing picture of Muslims in India. The Sachar Committee Report put forth a compelling narrative on exclusion and discrimination of Muslims in different fields including livelihood and education. Over a decade has lapsed since Sachar Committee Report was released. It is imperative that data related to socio-economic and educational status of Muslims is updated statewise. The “Living Reality of Muslims in West Bengal” (LRMWB) Report on the conditions of Muslims in West Bengal attempts precisely this. The state of West Bengal has a rich intellectual heritage with liberal ideas and inclusive vision of Tagore and other stalwarts. The baul- fakir tradition is very popular in Bengal and reflects very strongly in different aspects of Bengali culture like songs, paintings and dance. This inclusive framework of culture and ideas has been germane for flourishing of religious reforms and progressive liberal ethos. West Bengal was ruled for 34 odd years by CPI (M), a leftist party, theoretic presumption being that it is ideologically secular and sensitive to the marginalized. Yet the Sachar Committee Report painted a rather sordid picture of the Muslims in West Bengal wherein it stated that Muslims lived in abject poverty. The Sachar Committee Report suggested that only 16.8% of the Muslim population lived in urban areas in West Bengal against 28% of general population in 2001. The infant mortality rate of Muslims in West Bengal was reported to be at 52 against 50 of the Hindu community while infant mortality rate under 5 years of age reported for Muslims was 77 against 68 amongst Hindu community. The literacy rates amongst Muslims in the state was 57.5% while that prevalent amongst Hindus was 72.4%. In 2011, Trinamool Congress won a landslide victory and came to power in West Bengal after defeating the incumbent CPI (M). The CPI (M) evoked disaffection of the people of West Bengal and especially the Muslims after the Nandigram incident which created insecurity about land and livelihood. 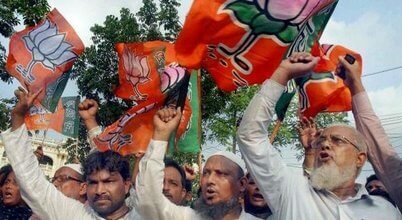 One of the factors that made TMC’s electoral victory in 2011 for state Assembly possible was the support of the Muslim community in the state had shifted to the TMC. Though West Bengal never reported major riots during the Left rule, it didn’t imply that Muslims had equal opportunities or that the polity was secular. On the other hand, Mamta Banerjee has attended rallies of Jamiat- Ulema e Hind, wore Muslim hijab, offered namaz but this mere politics of tokenism hasn’t translated into includion of Muslims. This isn’t much different than the treatment of Muslims by the Left parties in West Bengal. Three approaches have defined the policy of Trinamool and CPI (M) towards Muslims, namely, containment of communal violence so that it doesn’t assume critical proportions in terms of number of casualties and loss in property, political opportunism and tokenism- wooing powerful Muslim religious leaders for electoral gains, and not working towards the equality and inclusion of Muslims. The numbers can shed more light on the electoral politics and the stakes to be gained by wooing Muslim votes. In Assembly election 2011, Trinamool Congress won 184 out of 294 seats (38.9% votes), Congress won 42 seats (9.1% votes), CPM won 40 seats (30.8% votes) and BJP did not win any seats (4.1% votes). Similarly in 2014 general elections, Trinamool Congress won 34 seats of 42 seats (39.4% votes), Congress won four seats (9.6% votes), CPM won two seats (22.7% votes) and BJP won two seats (16.84% votes) (Ibnlive, 2016). An extensive study on the Muslims of India by late Prof. Iqbal Ansari, later taken forward in West Bengal by Sabir Ahamed of Pratichi Institute, shows that 46 Assembly constituencies of the State have a Muslim “concentration” of more than 50 per cent. The figure is 40-50 per cent in about 16 seats, and 30-40 per cent in 33 seats. The data underscores that in exactly one-third of the seats, Muslim vote is the key factor to win an election. Moreover, in another 50 seats, the concentration is 20-30 per cent. Overlooking such data was possibly one of the reasons for the defeat of the Left Front in 2011. (The Hindu, 2016). This explains the scramble for Muslim votes by political parties like in West Bengal. The LRMWB Report is particularly insightful in the wake of increasing communalization in West Bengal. The essentialization of religious identity of Muslims and stereotyping is leading to demonization of Muslims even in West Bengal where they have a sizeable population. The recent incident in Kaliachak is a case in point. The middle class urban population popularly called the Bhadralok (Majority of the Muslims in West Bengal reside in rural areas) in West Bengal shape the public discourse by controlling sources knowledge like media and education. The increasing presence of the Hindu nationalists in some pockets work to polarize the attitudes along communal lines. The communalization, essentialization and demonization of Muslims help RSS strengthen its presence in W. Bengal. The LRMWB Report in the above context is discerning. The report written by Association SNAP, Guidance Guild and Pratichi Institute, is based on primary survey covering 325 villages and 75 urban wards from a sample of 81 community development blocks and 30 municipal bodies. The main findings of the Report present an undeniable yet absorbing narrative on the situation of Muslims in West Bengal. What is perhaps useful is the construction of the Muslim community. It is not viewed as homogenous but the complexities are dealt with while studying the various aspects of the community. The Report doesn’t limit the construction of Muslim identity to religion but takes into consideration other factors like region, language, occupation, educational levels amongst others which are determine access to various public services. The Report goes on to dispel many myths that are encouraged by media particularly about Muslim women and how they fall prey to the “orthodoxy” of the community. While it may have some grain of truth, the Report presents an objective picture in regard to education, livelihood, health and other amenities and how they are accessed by the Muslims. The Report goes on to assert that the particular state along with its specific socio-economic features determines the accessibility of opportunities to any community and not the religious-cultural identity. In regard to education, the Report points out to a dismal picture. However there is a silver lining to this in the form of girls’ literacy rates in the state. For instance the Muslim literacy rate is 69.5 percent as per the primary survey, 7 percent lower than the average literacy rate of West Bengal as per 2011 census. The 2011 census pitched the gender gap in literacy at 11.1 percent in West Bengal; however the primary survey showed the narrowing of this gap to 7.8 percent. Also, the 2011 census stated a difference of 2.2 percent between general and Muslim women but the primary survey found equal female literacy to general female literacy of 2011 census. This flies in the face of the social stereotyping that Muslim orthodoxy prevented girls education and underlines the grit and aspirations of Muslim girls. This is especially significant since majority of the Muslim population lives in rural areas in West Bengal. In terms of the rural-urban divide, the literacy rate of Muslims in urban areas is 75.4 percent while that in rural areas is 68.3 percent. The female literacy rate is better than male under the age of 17 since boys are forced to drop out of school to earn a livelihood. At the same time girls do domestic work which enables them to attend school. But this situation is reversed when gender roles force girls to start a family and boys are encouraged to opt for higher education in hope of better income. Another stereotype that is demolished through this report is that Muslim parents prefer sending their children to Madrasas since they are anti modern and against secular education. The Sachar Committee Report had pointed out that less than 4 percent of Muslim children go to Madrasas. This is not surprising given that there are never adequate numbers of schools in areas inhabited by Muslims. This is reinforced by the report which states that the number of primary schools per ten thousand population increases in blocks with a decreasing proportion of Muslims to the whole population thereby highlighting a pattern of exclusion. Further district wise distribution points out that the districts with a significant share of Muslims in their population, such as Uttar Dinajpur (6.2), Murshidabad (7.2) and Malda (8.5) perform poorly in combine secondary and higher secondary school as against 10.6 combined schools per hundred thousand population in other districts. Overall the Report alludes to the increasing aspirations of the Muslim community to get educated which is hampered by lack of higher education institutes close to Muslim majority areas in the state. Work Participation Rate (WPR) for this study is defined as percentage of population belonging to the working age group of 15-65 years who are actually working. It is reported that the Muslim WPR is 45 percent. Only 8.9 percent of Muslim women were found to be working. Though the work participation rate varies widely across districts, districts like Malda (13) and Murshidabad (21.5), women are mostly engaged in bidi rolling and embroidery work. Among Muslims in rural West Bengal, about 47 percent of all who work, work as agricultural workers or daily workers in non-agriculture. Only 1.55 percent households earn income as school teachers and 1.54 percent is employed in regular public sector jobs. The starkest finding of the report is perhaps the insights it gives into the income of Muslims in West Bengal. The Report spells out the extent of poverty with the finding that about 80 percent of the Muslim households in rural West Bengal report an income of Rs. 5000 or less per month which is close to the cut off level of income for poverty line for a family of five. Further, 38.3 percent Muslim households in rural West Bengal earn Rs. 2,500 or less per month. More than three-fourths of the rural Muslim households possess no land. More than half of the poor Muslim households in rural West Bengal do not possess BPL cards or MGNREGA job cards. 23.8 percent of urban Muslim households earn Rs. 2,500 or less. This poor performance on the front of citizenship rights points to inadequacy of the State to make democracy meaningful for such a large population. The amenities available such dwelling conditions also give a glimpse into the security enjoyed by a population. It’s rather disappointing to note that 59.1 percent houses of Muslims in West Bengal are built with low quality materials like straw, leaves, bamboo, plastic, polythene, soil and mud bricks. On the other hand, 47.8 percent of general households are made of such material. Alternatively, 47.9 percent of the general populace lives in homes made of concrete and baked bricks, whereas only 36.6 percent of the Muslim population can afford such homes. The Muslim community’s access to tap water is nearly 40 percent less than that of the overall population. The availability of drainage system in Muslim households is meager at one third of that enjoyed by the general population. Healthcare, one of essential indicator of human development, accessed by the Muslim community depicts a sorry picture. The state average of the number of hospitals per lakh population is 1.8. However in Muslim dominated regions like Uttar Dinajpur, Malda and South 24 Parganas, this number stands at 1.0, 1.4 and 1.3 respectively. Similarly, the infant mortality rate amongst the Muslim community is 23 percent higher than the infant mortality rate in the Hindu community. The data suggests that Muslims prefer institutional delivery where the hospital is within accessible distance. This poses a strong counter to the widely held belief that Muslims orthodoxy is averse to institutional delivery. A case in point is also Kerala. The Report has dedicated a separate chapter on gender which in details evaluates the condition of women under various parameters but which is not included here in greater depth due to constraint of space. The contribution of this Report is immense by bringing into limelight the objective truth about the Muslims backed by such forceful figures. This counter narrative about the desire of Muslims for better education, livelihood and health amongst other rights makes it morally and constitutionally obligatory on the State to take notice and enable the Muslims to come at par with others. This report coming before the state assembly elections, hopefully, will create awareness about how the ruling dispensation uses vulnerable communities as mere pawns and vote banks for political power without serious intention of working for their inclusion and equality. This attempt can be duplicated by civil society organizations in other states to update the data about Muslims. Such reports will help in filling in the gaps in the data regarding vulnerable communities warped in exclusion, adverse public perception and discrimination.